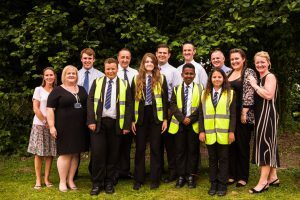 The Oakland Foundation, a local charity working with young people in Redditch and Bromsgrove, has celebrated with the first group of students to undertake and successfully graduate from ‘The Oakland Programme’- a project initiative launched in January. An innovative young people’s project, the pilot programme provided valuable workplace experience for students which will enrich their academic studies. It also included structured sessions aimed at raising aspirations and informing future career choices. Students and their family members listened intently at the graduation event as Dean Attwell, CEO of Oakland International and the charity’s main sponsor, told them of his own personal career journey before presenting them with their certificates and a surprise family ticket to see the outdoor screening of The Lion King at Worcestershire County Cricket Club. “Through the time they have spent at Oakland, the pupils have had a unique opportunity to see the world of work in action which makes it easier for them to start thinking about their own aspirations. “It is rare for pupils of this age to have such an experience and is another great example of the way The Oakland Foundation works in partnership with the school to improve the futures of local young people.”The Oakland Programme will next run at Ipsley CE RSA Academy in the new academic year, and will include at least three more schools, including high schools, from across the Redditch and Bromsgrove areas.